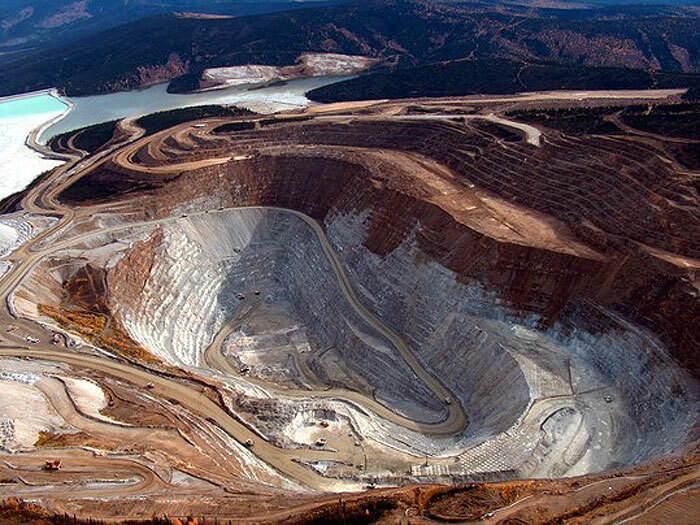 Fairbanks Gold Mining Inc./AP - Fort Knox Mine, which is currently the largest operating gold mine in Alaska. A new study based on observations from space suggests the gold on Earth came from rare neutron-star collisions. Gold — atomic number 79, element symbol Au, the most widely beloved of the precious metals — might have its origin in extremely rare and violent explosions in the far reaches of outer space. The bling apparently begins with a blam. For many years, scientists had theorized that the heavy elements of the periodic table, such as gold, platinum, lead and uranium, had their origin in supernova explosions. But an astronomical observation in June has produced evidence that such metals come from something even more exotic: the collisions of ultra-dense objects called neutron stars. It has long been understood that Earth’s elements are of cosmic origin. Carbon and oxygen atoms in our bodies, for example, come from the interior of stars, where they were formed under high pressure and heat. They were later spewed into the universe in supernova explosions. It is literally true, as the late astronomer Carl Sagan was fond of saying, that we are all star stuff. But new evidence suggests that gold and other heavy elements don’t come from supernovas, but from the neutron-star smashups. “We are all star stuff, and our jewelry is colliding-star stuff,” said Edo Berger, an astronomer who led the research at the Harvard-Smithsonian Center for Astrophysics in Cambridge, Mass. Neutron stars are the collapsed cores of stars that have exploded in a supernova. A neutron star might be roughly the diameter of the District but contain as much mass as our sun, or more, with all of it crammed together by the force of gravity until even the atoms have collapsed, leaving the object with the density of an atomic nucleus. A teaspoon full of neutron-star material would weigh, on Earth, about 5 billion tons. Most of these cosmic fruitcakes are solitary wanderers, but some are paired up, as remnants of binary stars. They can orbit each other for a billion years but will gradually drift closer and closer, spiraling together in obedience to Einstein’s laws of general relativity. One day, they will catastrophically merge. This sort of thing isn’t a routine matter at the galactic level. In the Milky Way galaxy, with hundreds of billions of stars, such a neutron-star collision is likely to happen about once every 100,000 years, Berger said. But the universe is big, containing many billions of galaxies, and so astronomers doing an all-sky survey will occasionally see one of these rare events. So it was that on June 3, NASA’s Swift space telescope observed a flash of light called a short gamma-ray burst (GRB) in a galaxy 3.9 billion light years away in the constellation Leo. The burst lasted only two-tenths of a second. Astronomers scrambled to reobserve that tiny patch of space with a powerful telescope in Chile and the Hubble Space Telescope. They saw something glowing where they’d earlier seen the GRB. After comparing their observations with theoretical models, the astronomers concluded that they were seeing the radioactive afterglow from a huge quantity of heavy metals formed in the explosion caused by merging neutron stars. 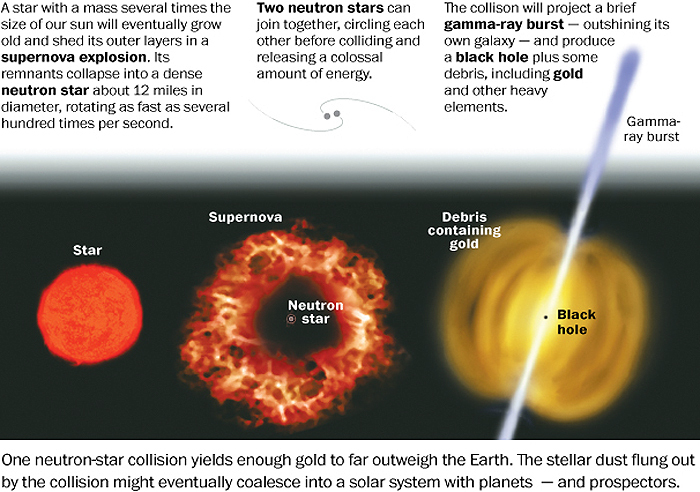 The afterglow of a neutron-star collision suggests to scientists that most of the gold in the universe originates from the union of super-dense stars. A new study looking at short gamma-ray bursts in space suggests the gold on Earth came from colliding dead neutron stars in cataclysmic events that occurred long ago. The research by the Harvard-Smithsonian Center for Astrophysics was submitted to the Astrophysical Journal Letters. Astronomers panning the heavens for glints of gamma-ray bursts have struck gold. No, really. They found gold – so much of it, in fact, that they say they could potentially account for the universe's entire reserve of the precious metal prized by Earthlings for jewelry and industrial uses alike. All the gold in the cosmos may have come from stellar cataclysms -- the collision of two neutron stars, which sends bursts of particles and radiation into the universe. "We are all star stuff, and our jewelry is colliding-star stuff," said Edo Berger of the Harvard-Smithsonian Center for Astrophysics, paraphrasing iconic astronomer Carl Sagan. These neutron stars are the incredibly dense, deadened husks left from dramatic stellar explosions known as supernovas. Supernovas are what seeded a hydrogen-rich universe with heavier elements fused in the stars' cores, like carbon, oxygen or iron. But unlike carbon or iron, gold can’t be forged in the heart of a star, so its origin has remained something of a mystery. Berger discovered an answer during his search for short gamma-ray bursts. Gamma-ray bursts are flashes of high-energy radiation that signal truly powerful explosions that can come from billions of light-years away. Some of them are long, lasting even a few minutes, and others are incredibly short – fractions of a second, making them very difficult to catch in the act. Berger was looking for the short ones. And it was a flash in what's called GRB 130603B, picked up by NASA’s Swift satellite, that caught his attention. When his phone rang at 2 a.m., he and his team quickly moved to examine the short burst – which lasted two-tenths of a second -- captured with the powerful Magellan/Baade telescope in Chile. 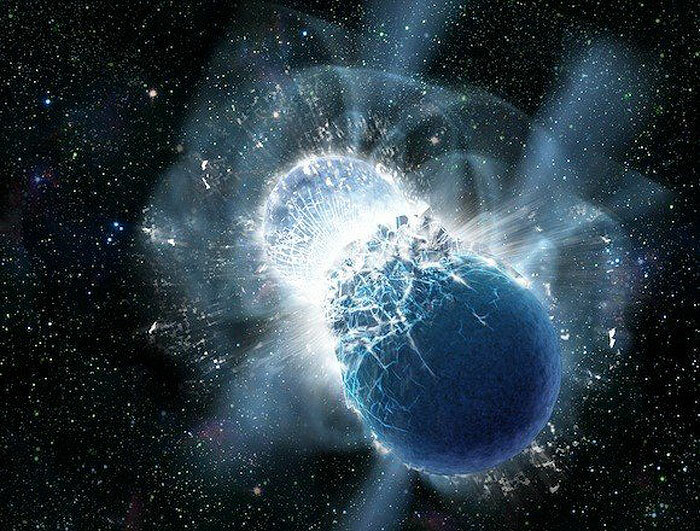 The burst appeared to be coming from the collision of two neutron stars – each roughly the size of Austin and filled with 1.5 times the mass of the sun – an impact that produced a black hole and the bright burst of gamma rays that they picked up. But they also saw something else around the bright beacon: A strange glow of infrared radiation. This, the astrophysicists realized, was coming from radioactive elements – like lead, thorium, uranium – decaying and thus producing the infrared light. Clearly, the explosion had been responsible for the creation of a whole menagerie of heavy elements. They estimated that an equivalent of 1% of the sun’s matter was being flung out from the collision in a tail, and about 10 parts per million of that tail was made of gold. Combining their estimate of the amount of gold from the neutron star mashup with the estimated number of such explosions since the beginning of time, it could even be that all the gold in the Universe came from such exotic collisions, the scientists said. Their paper has been submitted to the Astrophysical Journal Letters. So while there is indeed gold in them thar stars, should amateur prospectors still panning for the yellow metal lift their eyes from the ground and search the skies instead? Probably not. This exploding star system is 3.9 billion light-years away. In any case, if such a huge amount of gold ever landed on Earth, "the price would plummet," Berger pointed out.